No Type 6 from Iron Horse? Discussion in 'Downhill & Freeride' started by speedster, Oct 2, 2005. I thought the new Type 6 from IH was coming out...but I didn't see any pics from interbike or see any news online about it. Does anyone know if it is still coming out? look for a mid-year release. I believe this info has already been posted here on RM. search for it. i can't find anything in the search, and am MORE than interested in this bike. well maybe just interested. 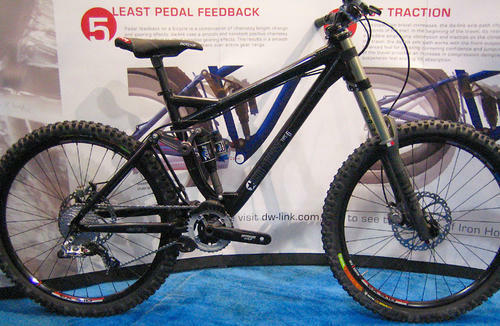 I thought IronHorse were not to bothered about releasing a bike at interbike they just release em when they release em. they had one but no shock on it,it will most likely be THE bike if it comes out like DW intends it to. The factory is at max capacity and it will take a while to get a few to test then produce,they are shootin for July. According to the guy I just spoke to at Iron Horse this is not the new Type 6. It looks like the same bike I posted about a while back. It is supposed to be a Super D style bike with Sunday like geometry. It is planned to be an 07 model. The Type 6 that was at Interbike was supposed to be orange with a Fox 36. ...hmmm, somebody is confused, it says Type6 right on the downtube. Definitely no confusion at all. The lastest thread just has better pictures of the wrong bike. It does say Type 6. I could put a Porsche sticker on my Huffy but it doesn't make it a Porsche. The biggest giveaway is the Type 6 is supposed to be able to use a regular front derailluer. Scroll down and read post #10 from DW himself. ..no need to get your feelings hurt, I wasn't implying that YOU were the confused one. IMHO, if Huffy exhibits a new model at a bike show displaying a porsche sticker...someone was definitely confused. No matter how you try & dress the situation up, whether or NOT that is indeed the Type6, it is clearly displayed as such. Is this so hard to understand? Nice lloking ride....regardless! I think i am going to hold out for the release of this bike. IMO its perfect. No feelings hurt. I was trying to make a point that is not a Type 6. That is from DW's own mouth. Can you trust DW - I hear he is more machine than man and his hair smells like WD40. and if you light him on fire he burns for 100days. I don't want to get anyone's hopes up here but the bike shown in these pics is a one-off race development project bike. If it sees the light of day it won't be for another 18 mos at the earliest. As for 06 Type 6's, they are delayed for at least a year due to frame factory capacity issues. We are not taking any orders on this bike. I don't want anyone's feeling hurt when the bike doesn't show up.